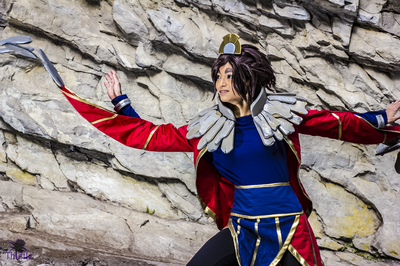 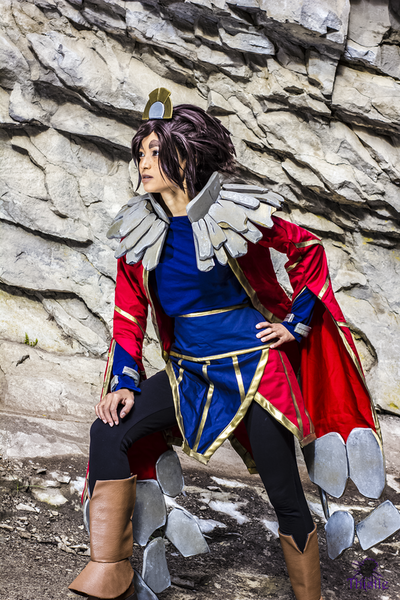 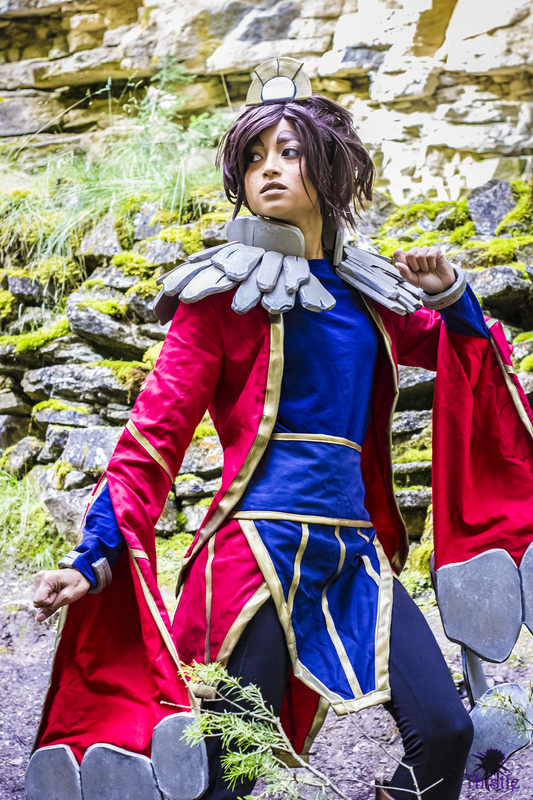 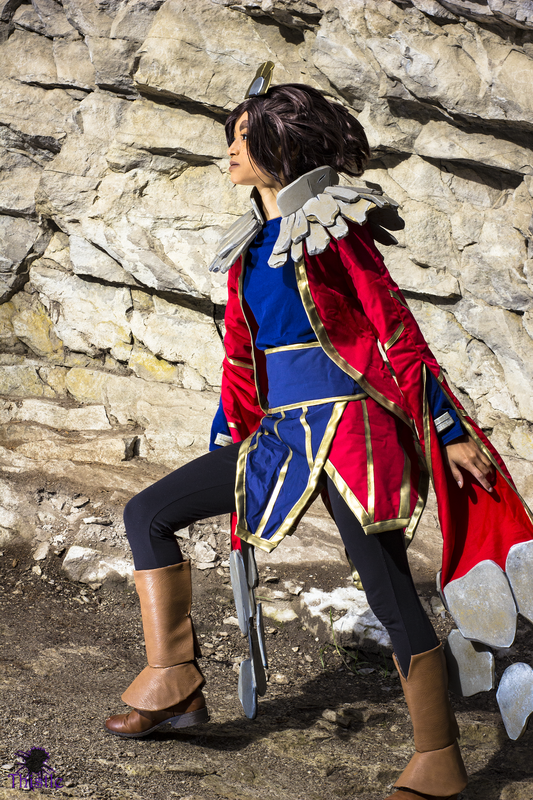 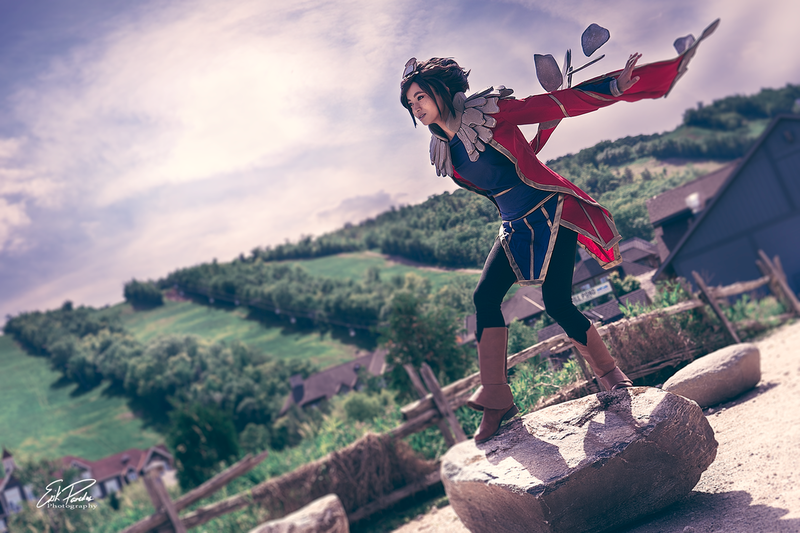 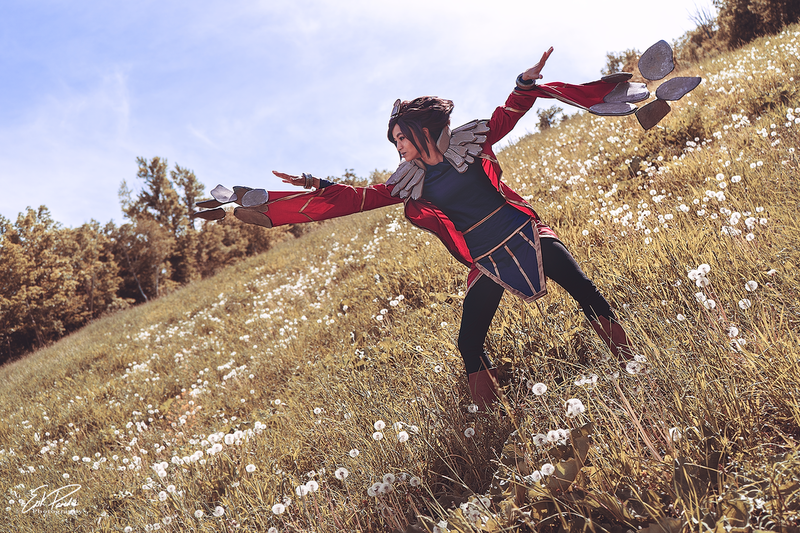 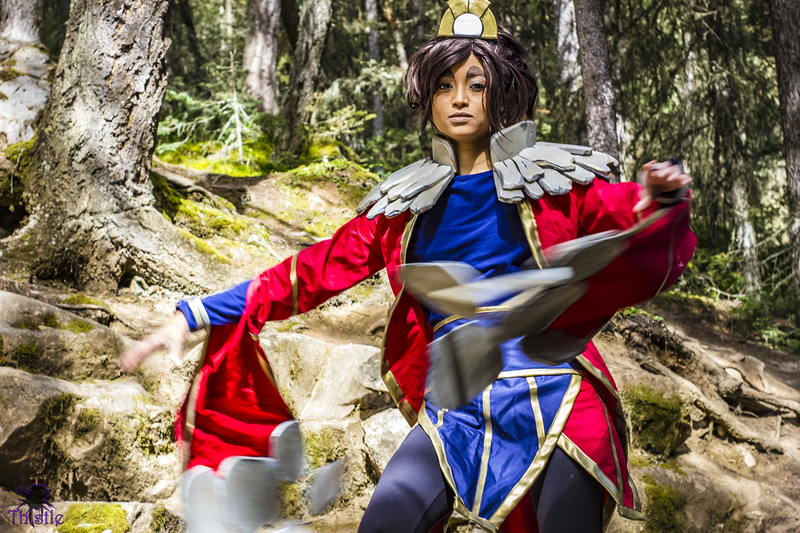 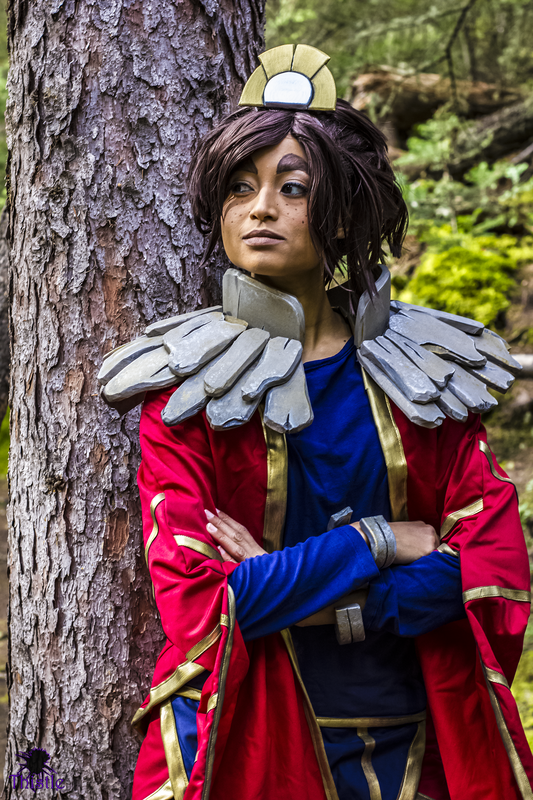 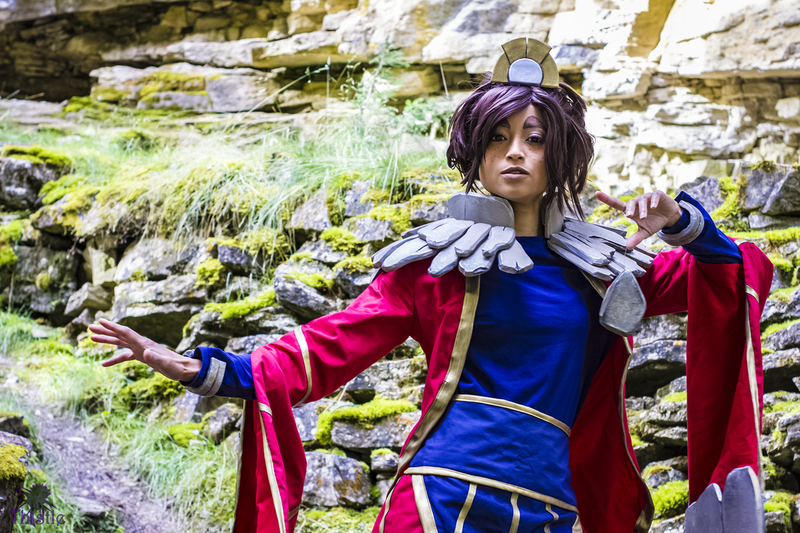 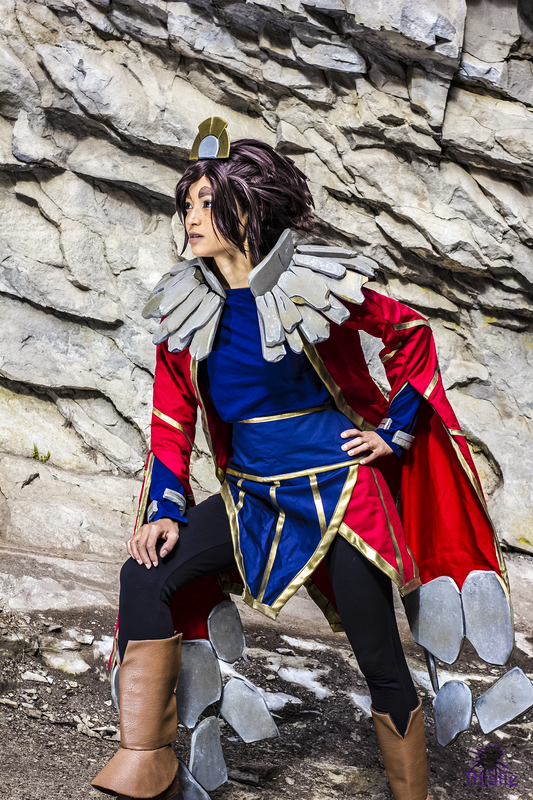 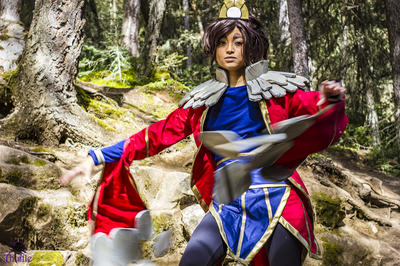 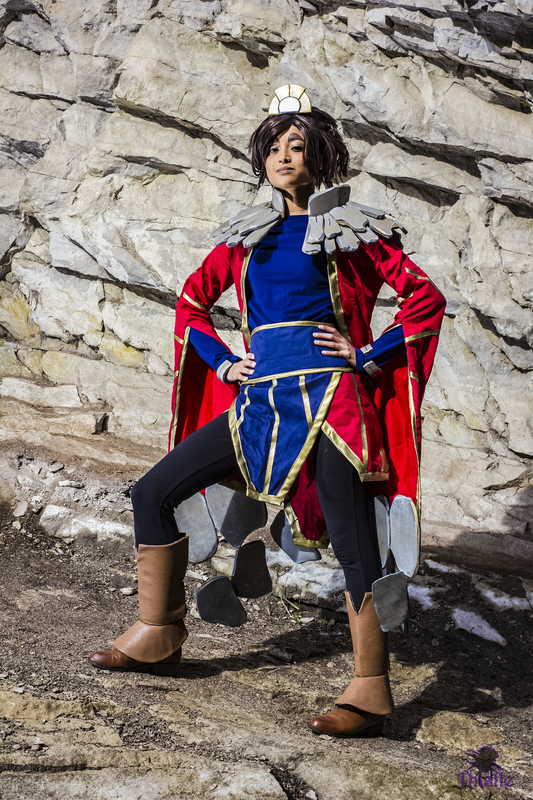 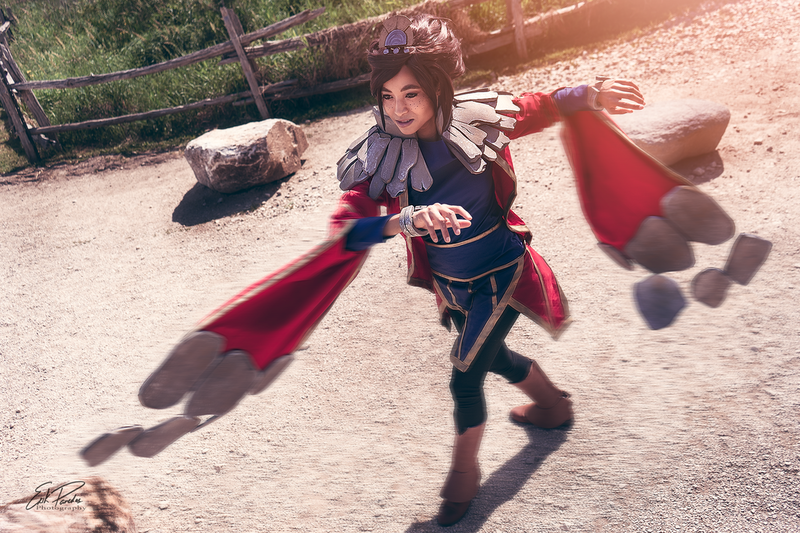 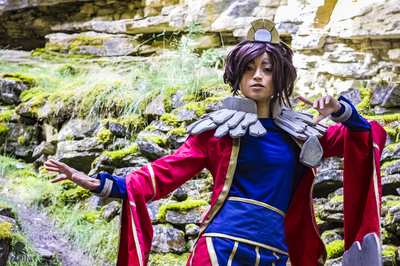 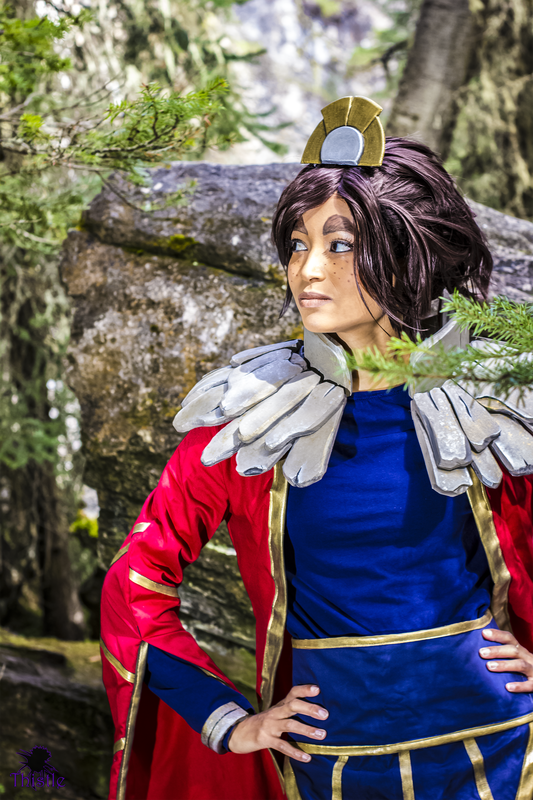 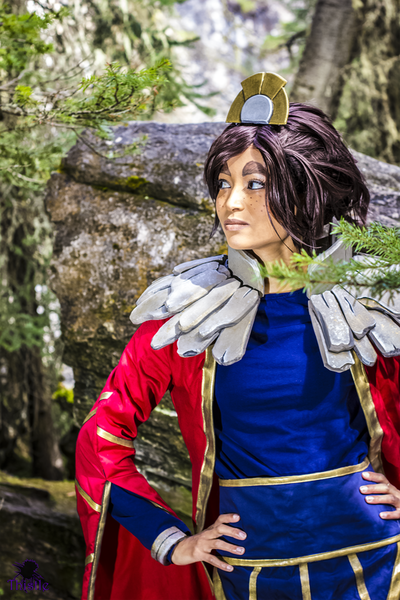 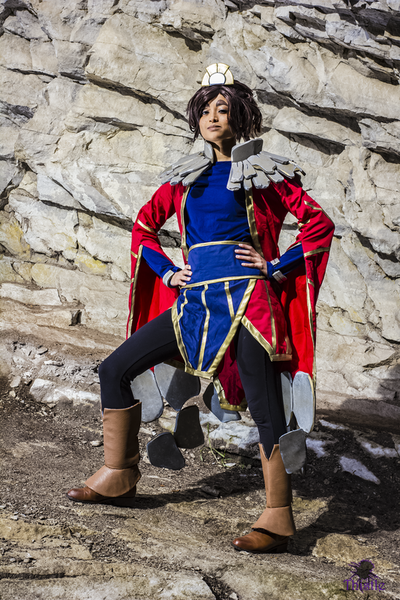 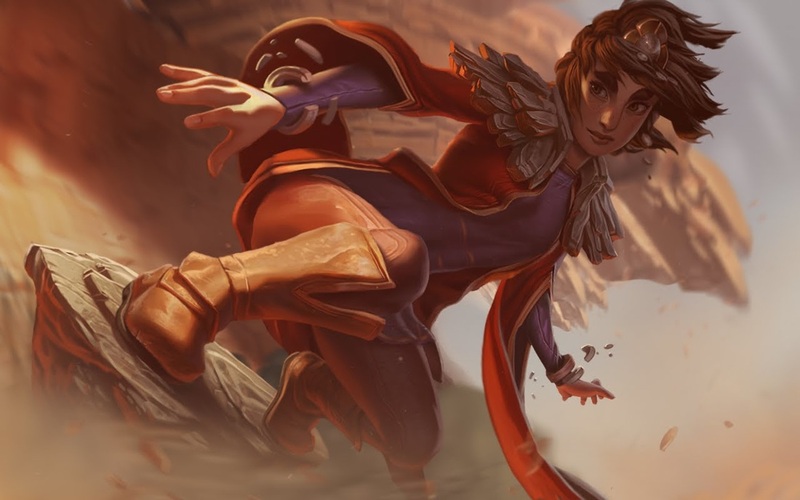 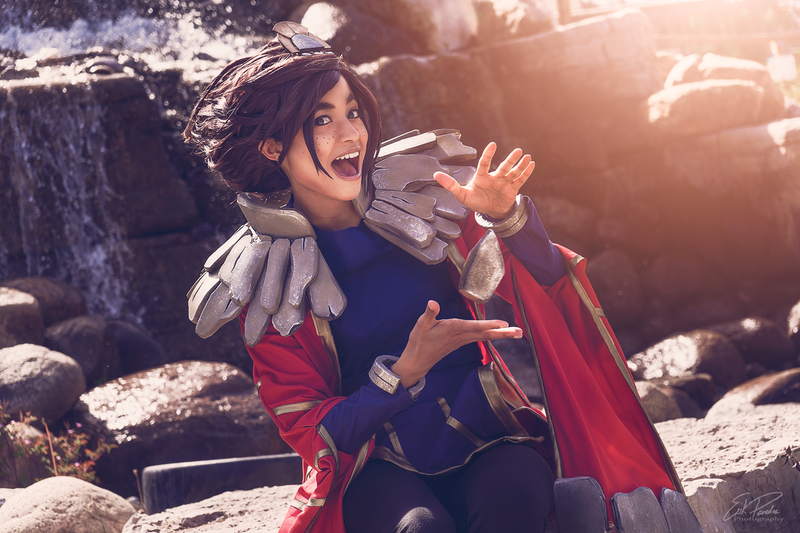 Taliyah is a fun character and I wanted to challenge myself when it comes to foam and makeup. 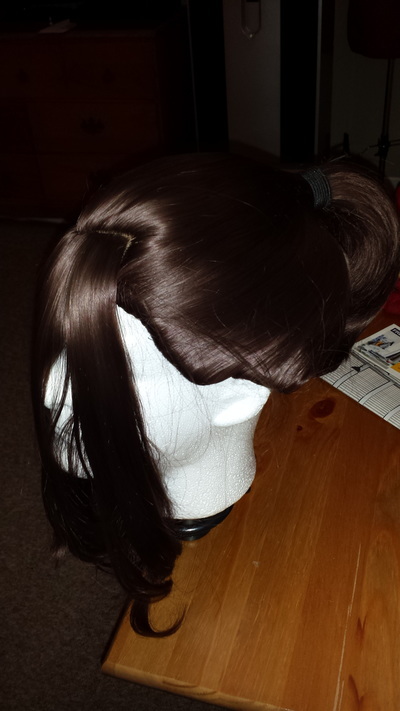 Wig: The wig was a dark brown Jeannie provided by Arda Wigs. 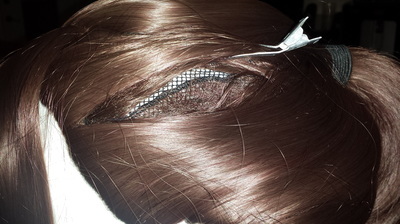 The wig comes with wefts already oriented towards the a ponytail so there was no need for heavy styling (removing and reattaching wefts). 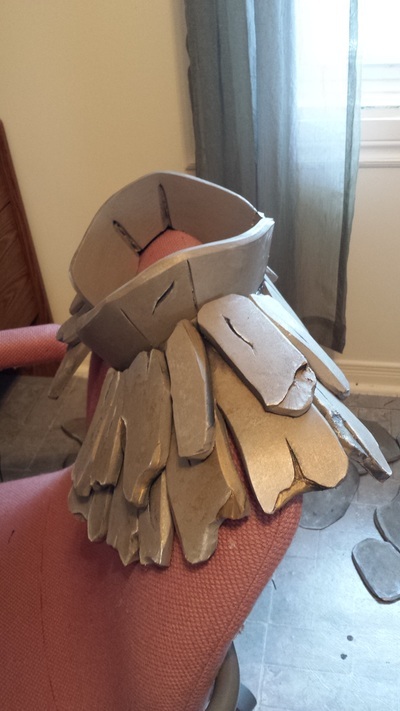 I bought a foam egg then cut in half, covered it in felt and then covered that in wefts from the clip on ponytail using hot glue. 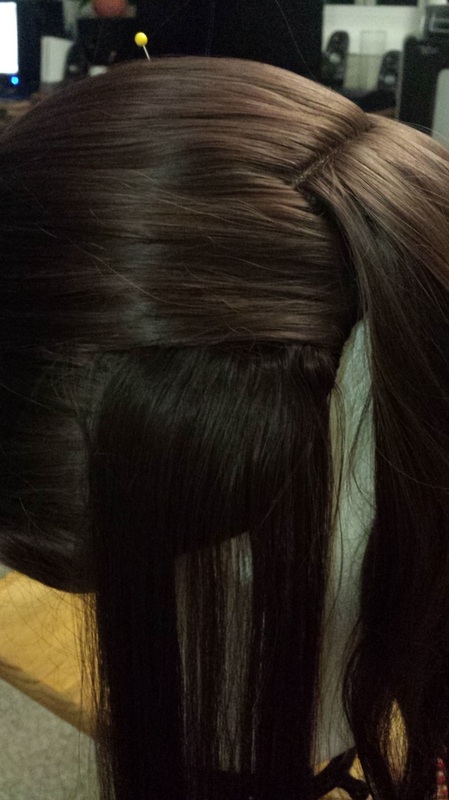 I stubbed the wig's ponytail after removing some fibres, then glued the egg to the stub and wig. I used a lot of Got2Be glued hairspray and some gel to form that pine cone coif. Additional wefts were also sewed near the hairline to add more heft to the bangs. Crown: It is made of craft foam and worbla then painted in acrylic. 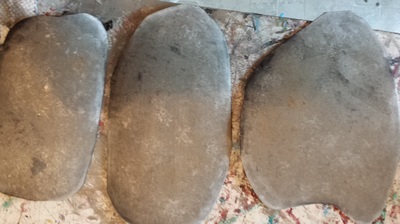 Armour: All armour or rock pieces were made with EVA foam. 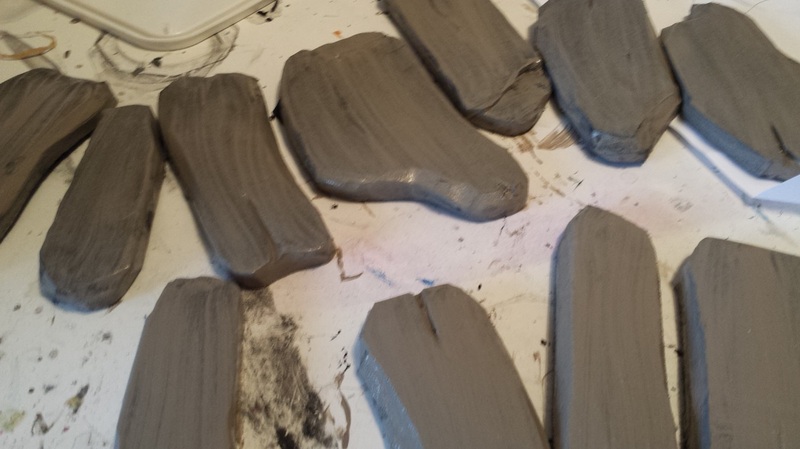 They were cut and beveled using box cutters. 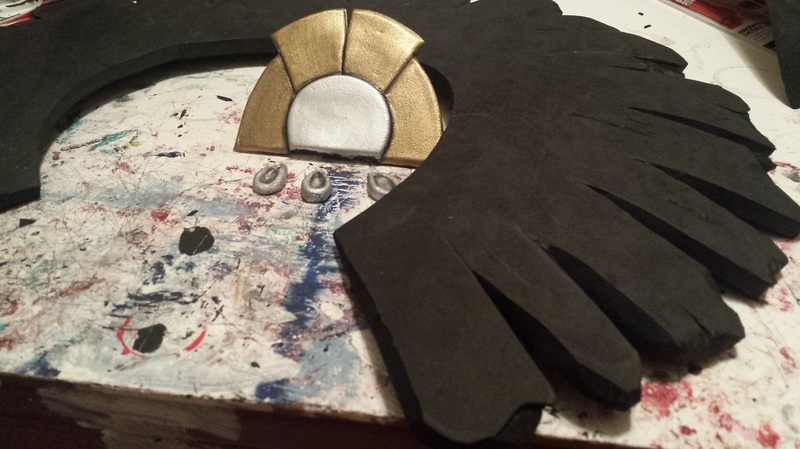 The paint job includes a grey base coat and many layers of stippled gold, black, white, and grey acrylic using sponges. 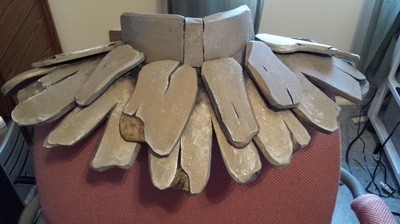 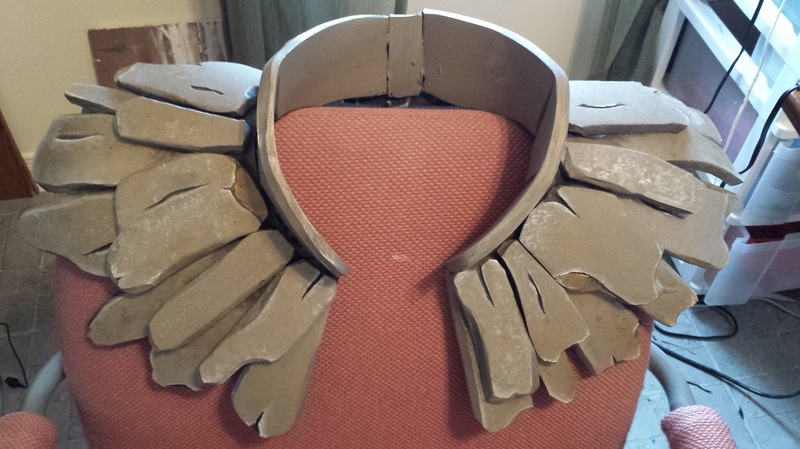 The shoulder piece was heat formed to fit and slips on and off without a harness. The rocks attached to the costume are glued directly to the fabric using a combination of hot glue and e6000 (That's me being cautious). “Floating rocks” are attached to the glued rocks using fishing wire wedged between layers of foam (EVA and craftfoam. Fabric: The jacket is made of red twill using a modified pattern. 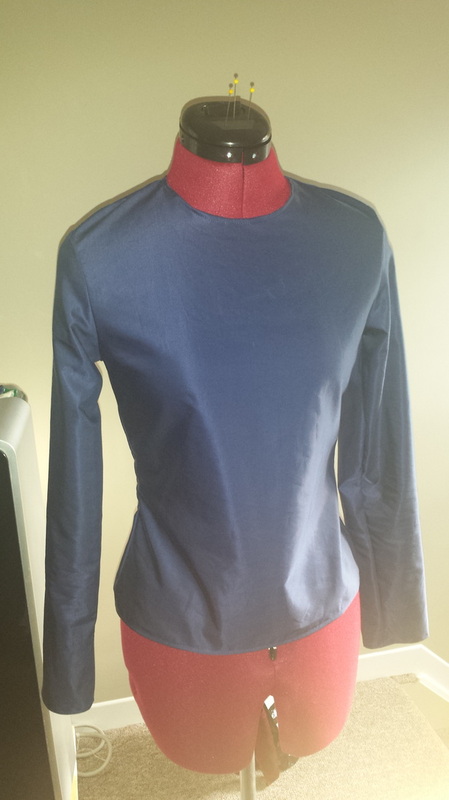 The blue shirt and belt are made of stretch navy cotton. 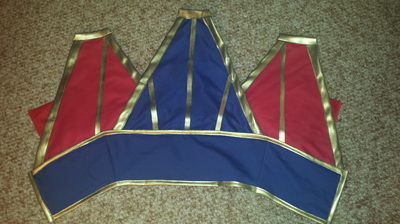 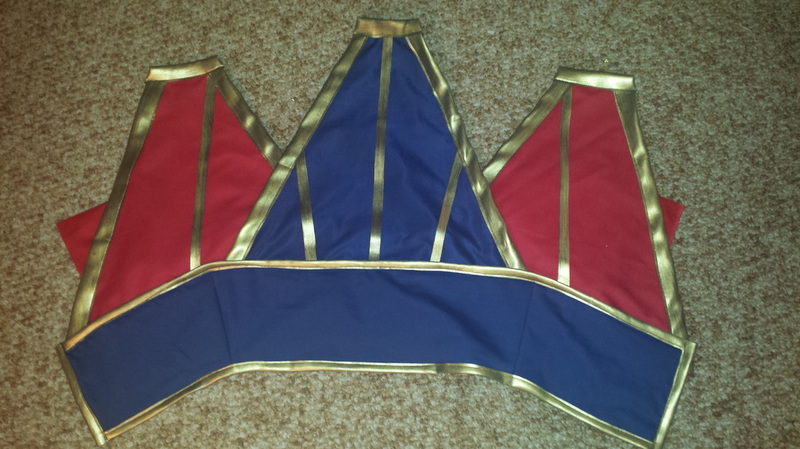 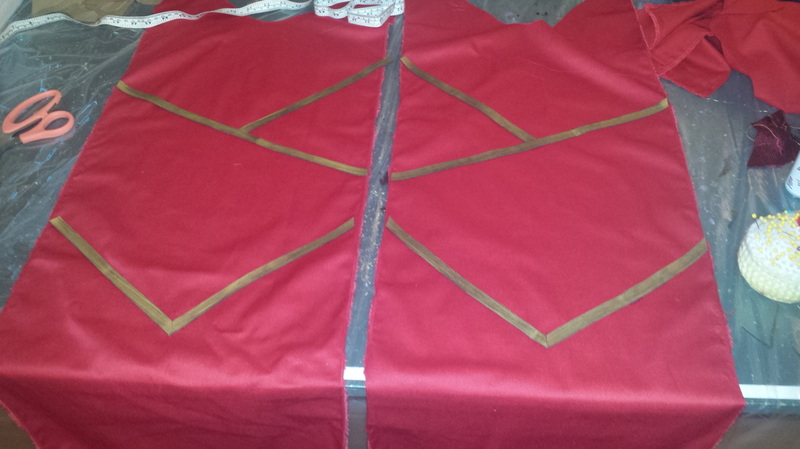 The belt has a lot of fusible interfacing used to give it more structure. 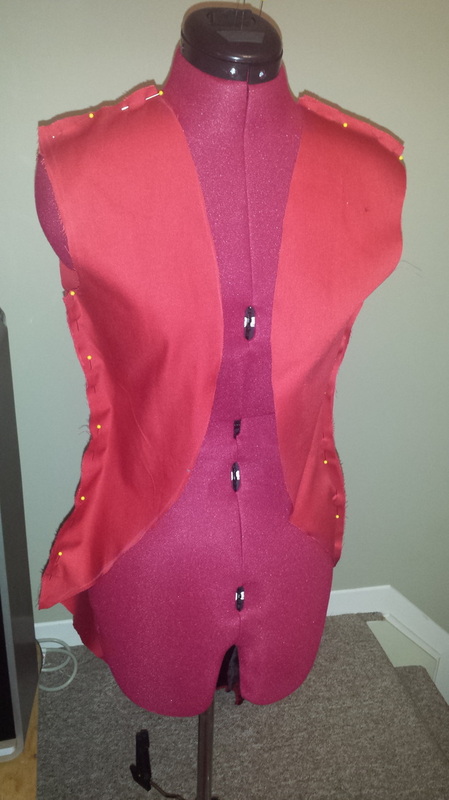 It clips in the back using a parachute clip. 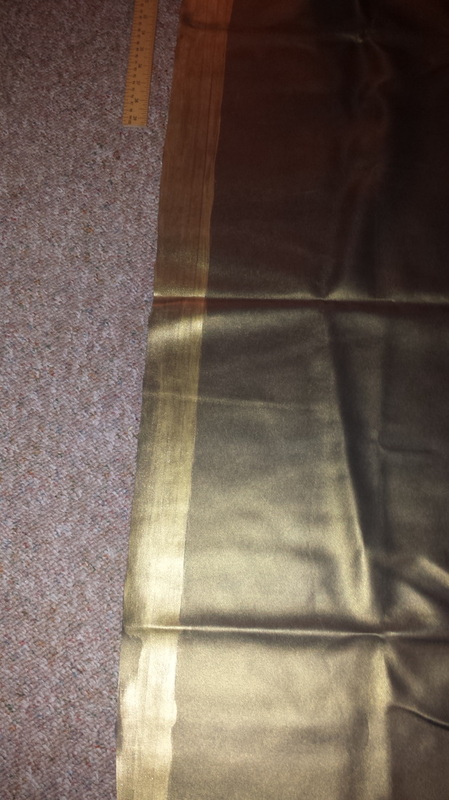 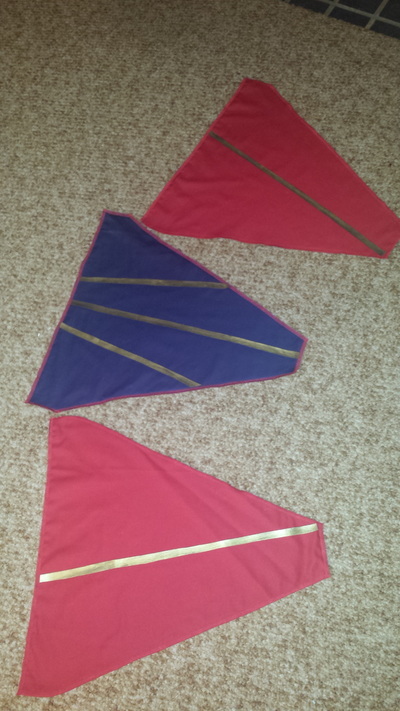 All gold trim is a gold pleather that was painted another richer shade of gold using Martha Stewart paint. 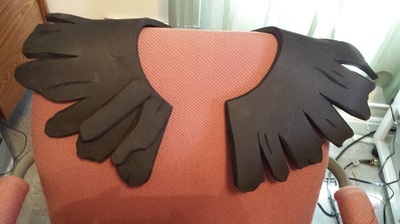 The black legging are a pair from my closet and the boot covers are made of craftfoam and covered in brown pleather. 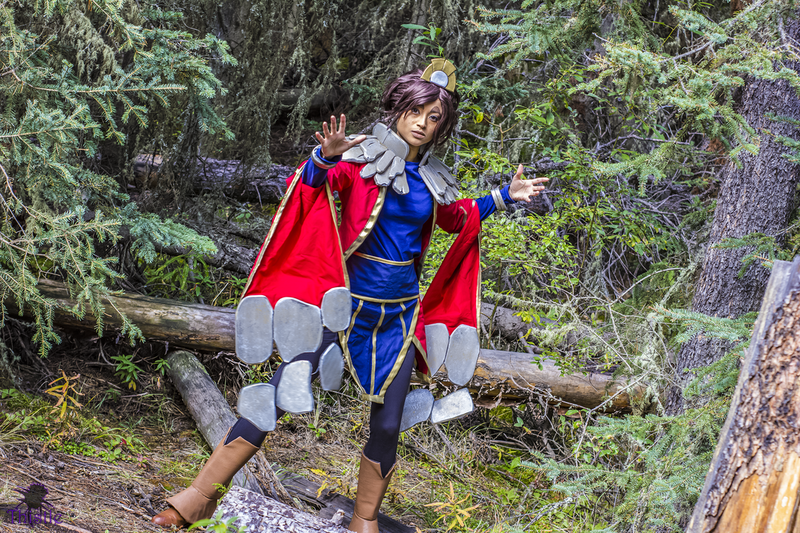 All photos by Thistle were taken at Johnston’s Canyon (Alberta) where we had to hike on a path next to rapids for 20mins. 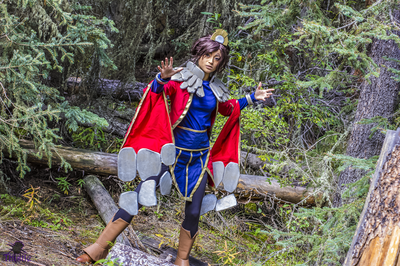 I had to bring the most of the costume in a hiking backpack, then I had to put in on next to all the tourists passing by.